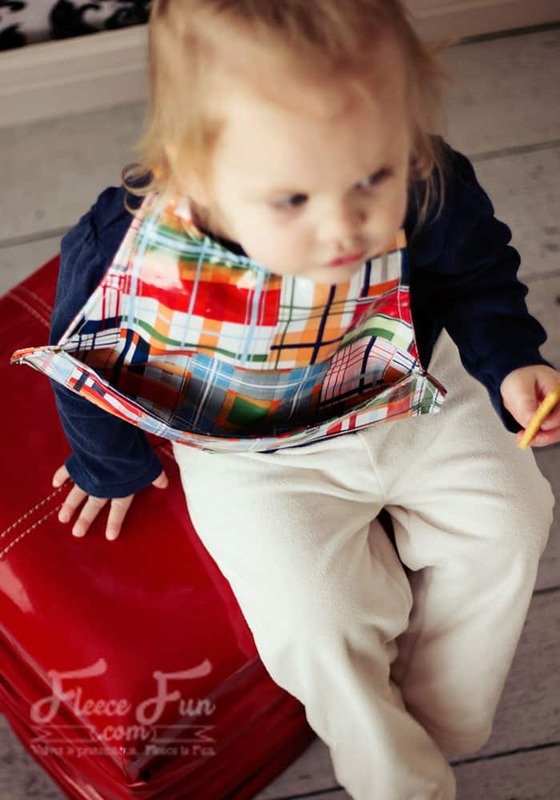 Free Sewing Pattern: You can make a baby bib! 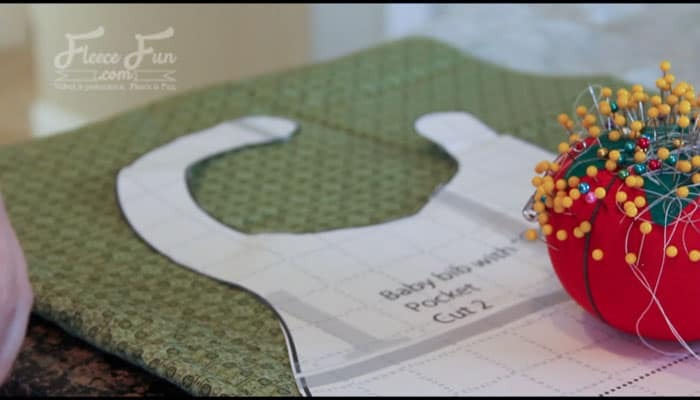 This free baby bib pattern pdf has a video tutorial to make it easy. Can be made with a catch all pocket or without. Baby bib has a generous size to cover baby completely and last for a while. This free baby bib pattern pdf is easy to make and versatile. You can make a cute and functional baby bib using a vinyl backed cotton, flannel and/ or terry cloth! 1/2 yard cotton backed vinyl, terry cloth, or flannel (see instructions to decide how much of what material you will need. For the Terry cloth bib you can also use deluxe bar towels) . Please be very careful when selecting what vinyl to use. 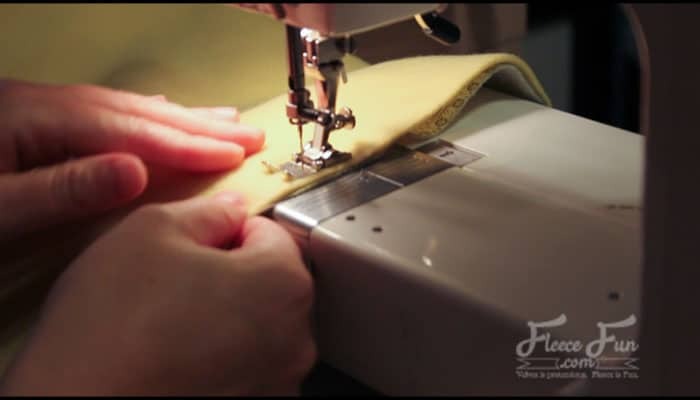 Not all vinyl cloth is baby safe – some emit dangerous fumes. Please check with your cloth merchant before purchasing. You will need to assemble the pattern. For instructions on how to assemble the free baby bib pattern pdf click here. There are multiple ways to make this pattern. 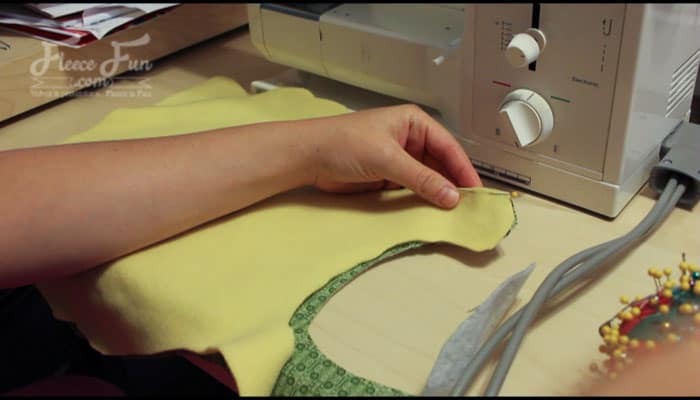 You can make a bib with a pocket, you can make a bib without. 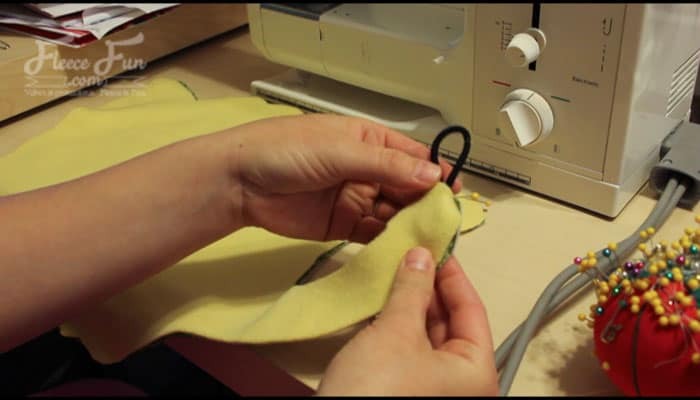 You can make a button hole, elastic or Velcro closure on the strap. 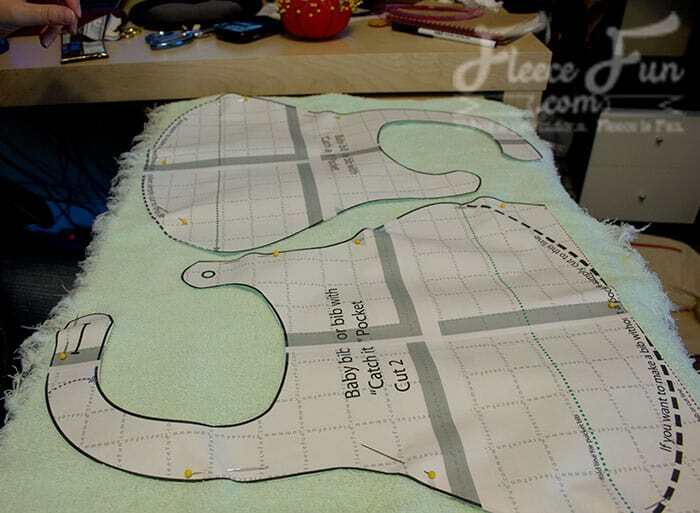 Please be sure to prep your cloth (terry cloth, flannel) by washing and drying it before you cut out the pattern. Decide if you are making one with a pocket or one without a pocket. Cut out 1 of the vinyl and 1 of the flannel or terry cloth). On the vinyl, just trace around with a pen rather than make additional pin marks. 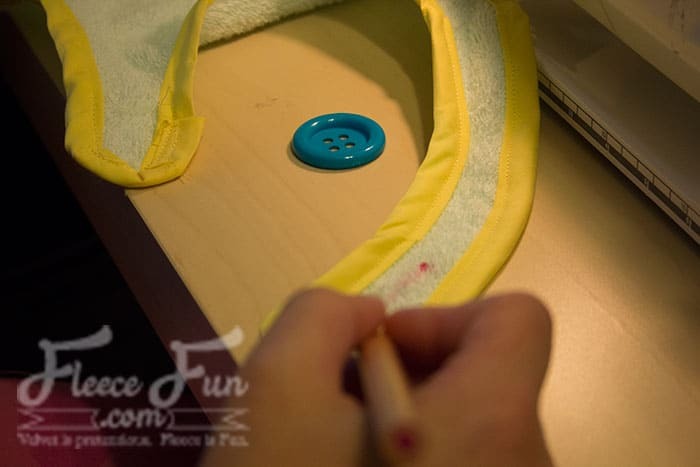 If you are make a single sided terry cloth bib pin and cut 1. You can also print up the pattern twice and lay it out as shown in the first picture. 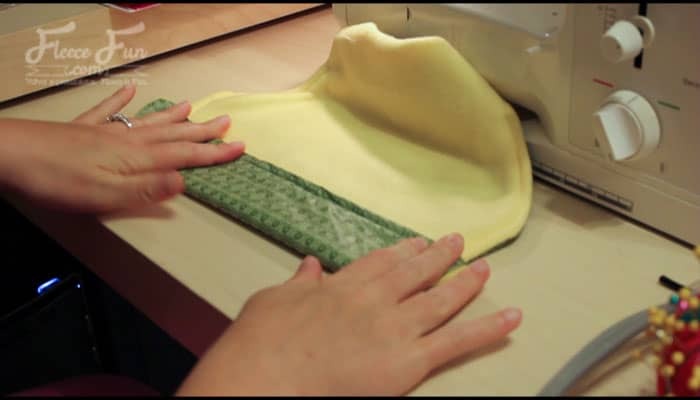 Tip: it’s easy to make several of these at a time – so fold the vinyl cloth over and cut 2 , do the same for the flannel and or terry cloth. This way you will be able to make multiple bibs. 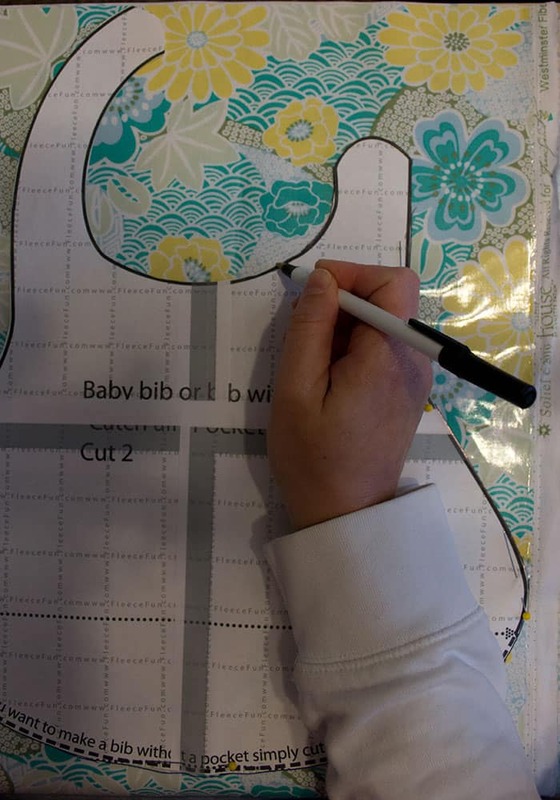 I made the strap extra long on the free baby bib pattern pdf, This way you can adjust it to fit your child perfectly – some kids need the baby bib right under their chin – others like to have a little more room. Take the flannel and hold it around the child’s neck and mark the proper length. If you are doing the elastic enclosure -We’re placing elastic at the end so not much over lap is needed. 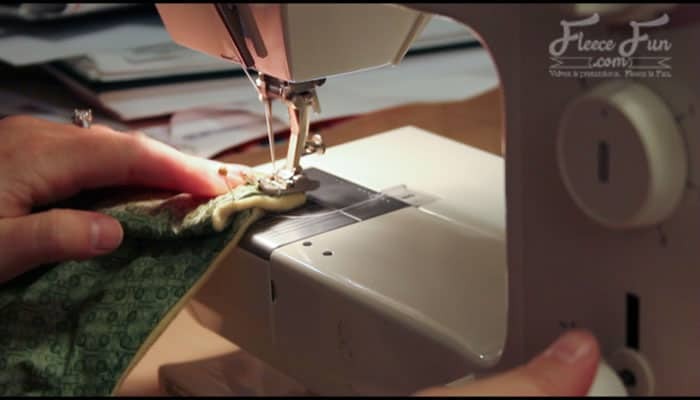 If you are using a button hole or Velcro allow for some over lap. If you don’t have access to the child there are guidelines on the pattern. Cut the long end of the strap to the proper length, curving the edge so it will look nice. Cut the Vinyl half to the same length. At the end of the long strap either pin a loop of elastic of a ponytail holder, sandwiched between the two fabrics. Be sure that the loop will fit over the button that you will be using. leaving a 2 to 3 inch gap for turning along the bottom. 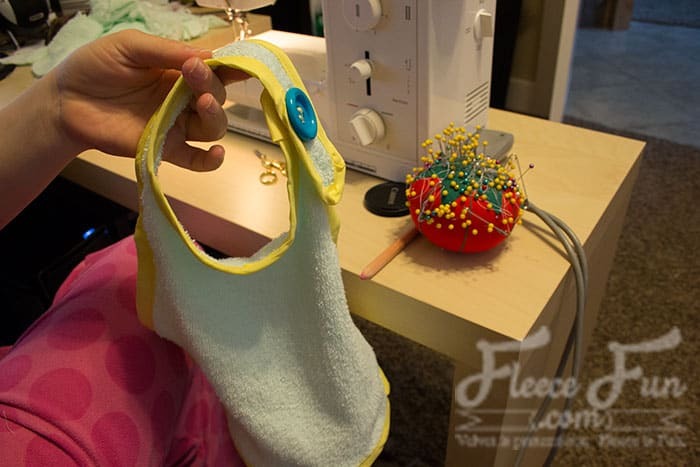 Note: you can use sew on Velcro instead of elastic and a button – add that after turning the bib right side out. Note: When pinning the pattern to the vinyl pin very close to the edge of the pattern as the pins leave holes in the fabric. You want all your pins to fall within the .5 seam allowance you will be sewing with. Regular baby bib: You have the option of either making it double sided (vinyl on both sides) or from 1 (or 2) piece(s) of terry cloth. If you are making it double sided refer to the pocket directions. 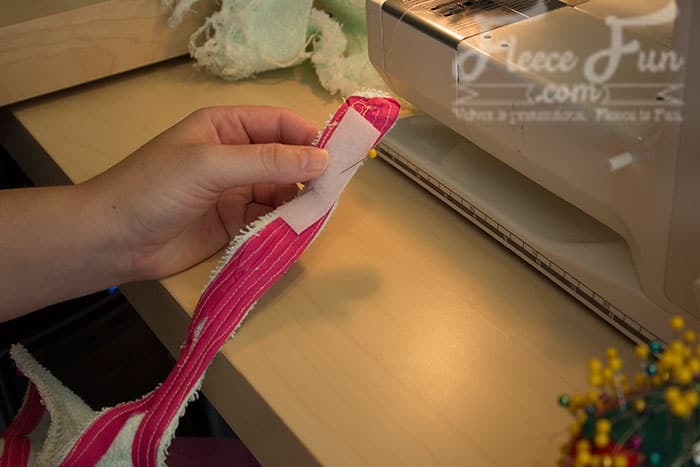 For a bib made from one piece of terry cloth you can use bias tape to finish the edges. If you want a contrasting look you can use double folded tape to “pinch” the out edge and sew that on (see yellow tape in picture). Trim the straps as needed. Turn the bib right side out. Tip: Be careful when turning the straps as the vinyl can stretch. If you used and elastic loop turning the long strap is easy. Get a crochet hook and grab the elastic loop at the end of the strap to help you turn it! 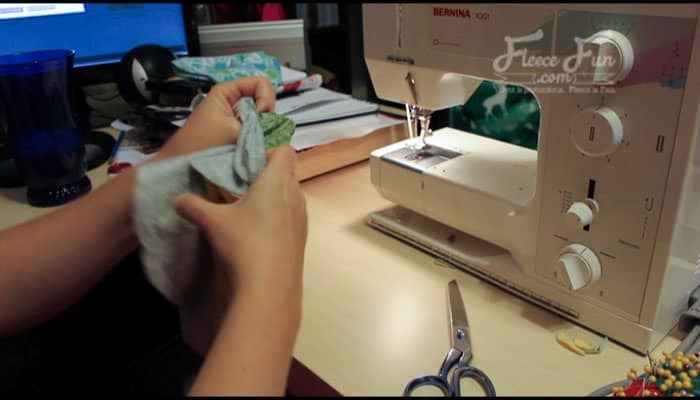 Once you have turned the bib completely right side out, top stitch .25 from the edge all the way around the bib – sewing shut the opening you used for turning as you go. For the pocket style you have one more step for sewing the pocket. Fold accordion style from the bottom. 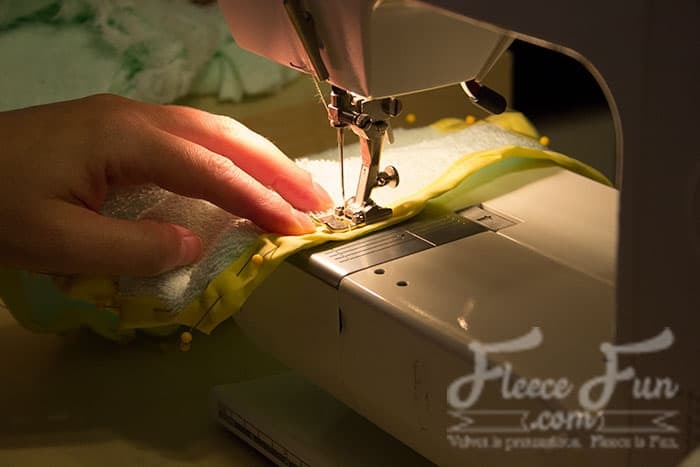 With the fleece side facing you and referring to the dashed line on the paper pattern, fold the first section up so the vinyl side is now visible on the top of the bottom fold, fleece should be touching fleece. pin fleece together. Now flip the bib over so the vinyl side is facing up. Referring to the paper pattern fold the bottom up, gently pin on the outside. 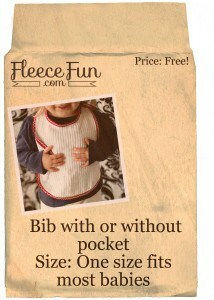 You should now have a pocket and only vinyl on the front of the bib. Sew along top stitching in place forming the pocket. Tip: to clean out the pocket just flip the pocket inside out. I wanted to make a pocket bib that wasn’t dependent on snaps or Velcro. For elastic closure: If you haven’t already add an elastic loop on the long side then sew a button on the short side of the strap. 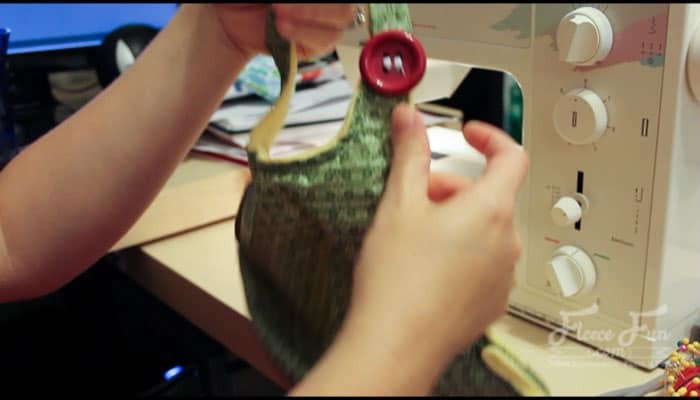 For button hole – mark button hole and sew on long strap. Sew button on short strap. Velcro – Place hook Velcro on the inside of the long strap and loop on the outside of the short. Place button on top of long strap if desired. 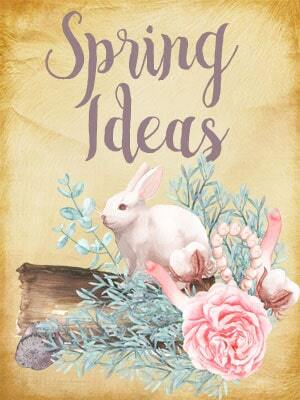 Trim threads and admire your handiwork! 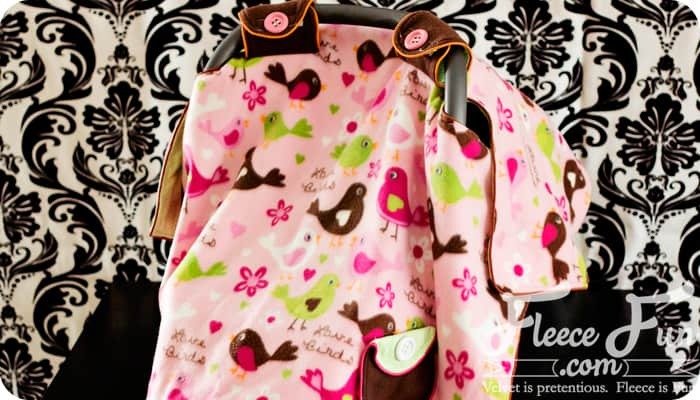 All of my free baby patterns – you can see those here. 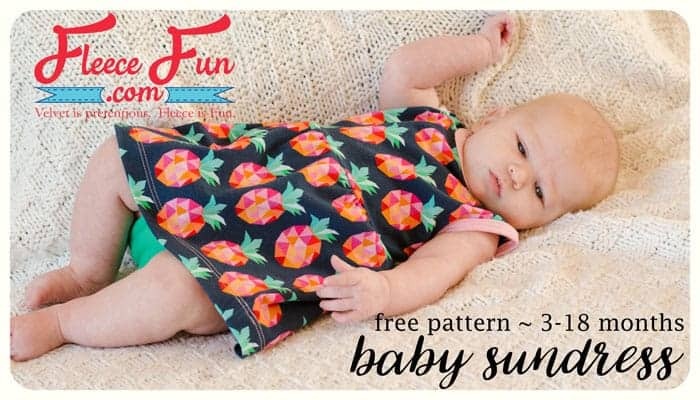 Love baby patterns? You’ll love this collection of free baby shoe patterns courtesy of Sew Sew Easy. Lovely tutorial. The video and the instructions were very precise and wonderfully written and spoken. Making some for my nephew and this is very helpful. The vinyl stretches as I sew. Should it be stabilized with zig zag or iron of pellon? I love everything in this tutorial! The instruction is very well said and done. All of the steps are clearly stated and I think it can be followed easily. 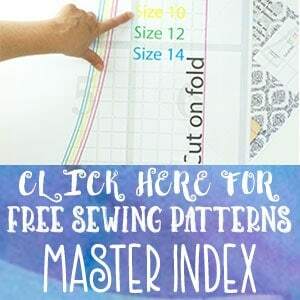 No wonder that through this pattern that you have shared many baby bib maker will be inspired to make some/to do so. Thank you for this one and you really did a very great job!